There is one room in our home that I haven't really touched, but it's the one I've been most anxious to change. It's the kitchen. Our cabinets are painted green just like the walls here. I've wanted to paint them white since the day we moved here 5 years ago, but it wasn't in the budget and I was too scared to do them myself. I've painted cabinets in other parts of our home, but we plan on living here forever and I want the kitchen paint job to last that long. So we are just starting to change the kitchen, but it will happen slowly. It started with this table that my dad built. Our previous table was nice, but it scratched SO easily and that drove us nuts. This one was homemade and my dad put 5-6 coats of poly acrylic on it. That means it's tough stuff and I love that. So we sold our last table, and we actually made money with the switch over. The cost of this table and the chairs came out less than what I sold our previous table and chairs for. Score. 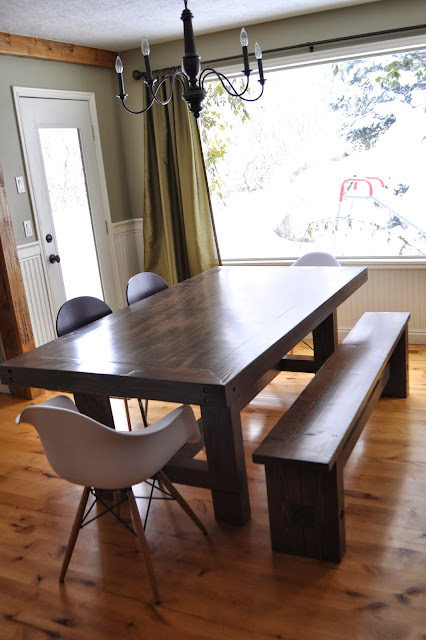 I have loved the look of a farmhouse table with modern chairs for a long time now, so after searching through online stores a lot I came up with a look I really liked. My dad built a bench for on side of the table. It's nice because it can acomodate a lot of people if necessary. 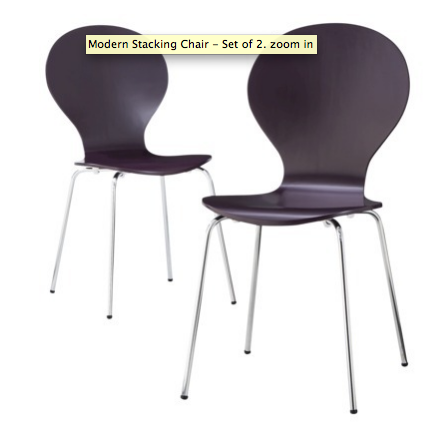 I purchased THESE chairs from Target in the plum color. The kitchen will be painted light gray and then there will be purple and lavender accents. There are similar chairs on lots of web sites, but these were the least expensive and after reading lots of reviews I felt these would work just fine. I purchased 2 sets, but when we aren't having people over I plan to leave just two in. I wanted a different chair for the table ends. 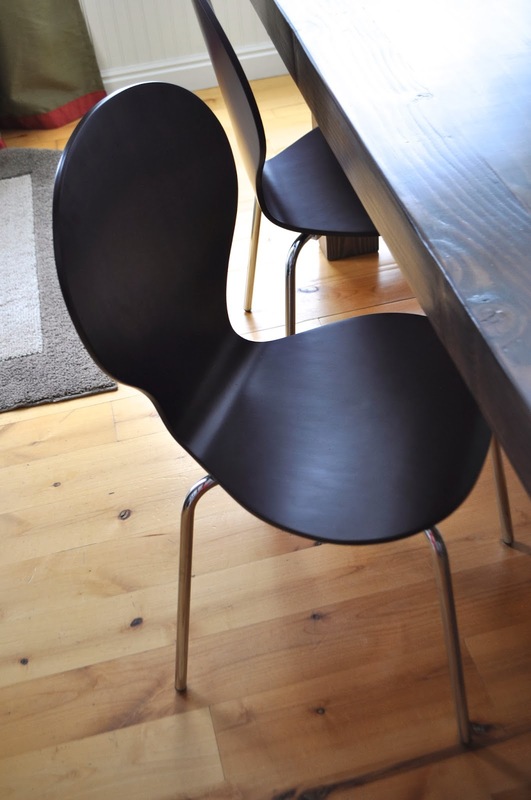 I loved the look of the Eames chair, but not the price. I purchased THESE from Overstock (when they had a sweet black Friday deal). They are definitely cheaper looking than the real thing, but I can live with that. I really like them. They are more comfy than they look. 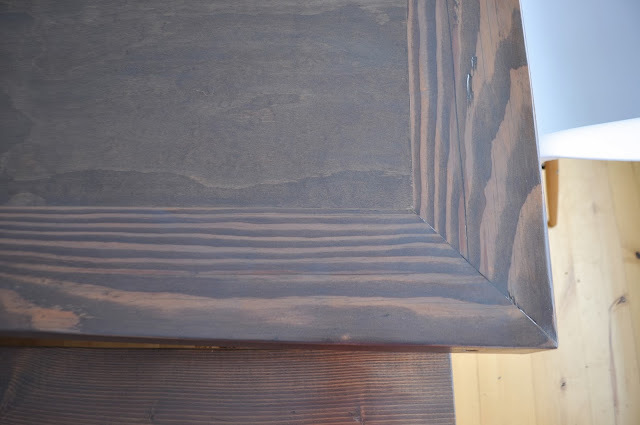 I love the rustic look of the table the way my dad built it. The counter-sunk screws are my favorite. For the color we did two different stains. I wanted the color to be unique. I didn't want espresso or just gray. I wanted more of a blend of brown and gray. I love the way it turned out. We used one coat of each of these. First the brown and then the gray. It took differently to the wood in the middle and the outer border, but I like how it made that most noticeable. The table looks different colors in different lighting. It's kind of fun. As I mentioned, the room will be painted gray, my mom sewed gray and white striped curtains for the space and the cabinets will be painted white in the next few months. The light fixtures will also be updated and that should pretty much do it. Since I won't be blogging when the change is made, feel free to follow me on instagram for occasional updates. You can even check in on instagram online if you don't have a smart phone. Just click on the camera icon in the right side column and it'll show you my feed. So that's where we're at right now. I'll show you the finished family room sometime next week. It looks great so far! And how cool how your dad just makes furniture like that, super! 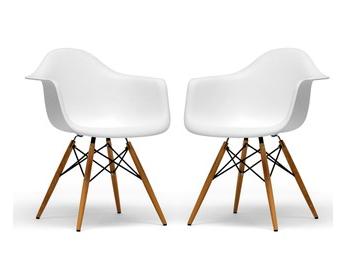 I have two of the same Eames chairs (not the real thing either, didn't like the price too) and they really are the best! Looking forward to the rest of the make-over! Have a great end of the year! Wonderful table!!! I really love it! Your father has golden hands!! The oral look of the room is super stylish! And I love a big window behind the table. I love it! The finished room is going to be amazing! looks great! that table looks like it will be useful for decades to come. as for your cabinets, don't be afraid to paint them!! we actually are in the process of giving our kitchen a facelift and are almost done. The cabinets were one of the first things we did and we are so happy with how they turned out. here is my blog post about the paint kit we used and the before/after! I love the table your dad made! 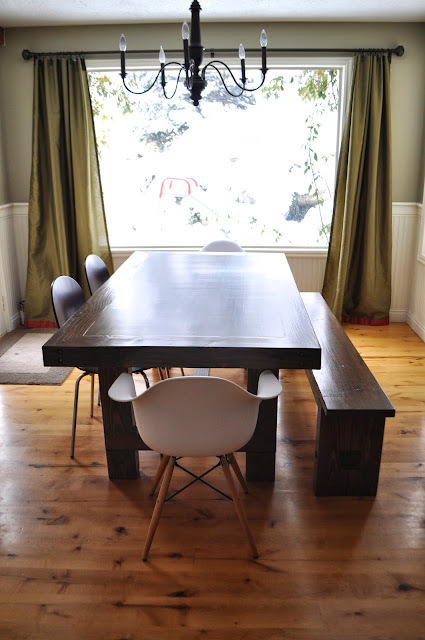 I have a large farm table and bench that I got from World Market, I love it but the chairs are showing their age, I have thought about switching to something more modern. Love the idea of following on Instagram! Your kitchen sounds fantastic! Thanks for all your amazing inspiration over the years. I don't really read blogs anymore, but when I find a little time, I do like reading yours. You will be missed, but I'm so happy for you and the new freedom you will enjoy. You've not only inspired me creatively but also been so good at sharing the light of Christ. Thanks for that. I will be following you on instagram of course. Okay...great minds. I bought those same white chairs to go at the ends of my table too! I have some other mismatched chairs on the sides and I love it. My table is a beat up IKEA table, definitely not as nice, but it works for now. And girl...I am so going to miss you in blogland, but I know you'll still be around on IG so that makes me happy. You are an inspiration and continue to be!